If the Centre agrees to relax the Fiscal Responsibility and Budget Management (FRBM) rules for Kerala, its ability to raise money from the markets may increase by around Rs 11,500 crore. In order to open more fundraising channels for reconstruction and rehabilitation of its flood-hit areas, Kerala is set to approach the central government to increase its market borrowings limit from 3 per cent of Gross State Domestic Product (GSDP) to 4.5 per cent. The state is already in talks with the World Bank to raise Rs 10,000-15,000 crore. This comes at a time when the Centre has declined aid from foreign countries like the United Arab Emirates, which, according to Chief Minister Pinarayi Vijayan, promised “Rs 700 crore”. “At present, our FRBM limit is 3 per cent of GSDP, which we are planning to ask the Centre to increase to 4.5 per cent,” said a state official close to the development. However, senior Union finance ministry officials say there are strict parameters for relaxing the FRBM limit, and hence the borrowing and expenditure limits, for a state. There are no precedents for relaxing the FRBM limits for any state due to natural disasters. “The FRBM limits are strictly defined and hence giving a one-time relaxation to Kerala because of the floods is unlikely,” said an official. 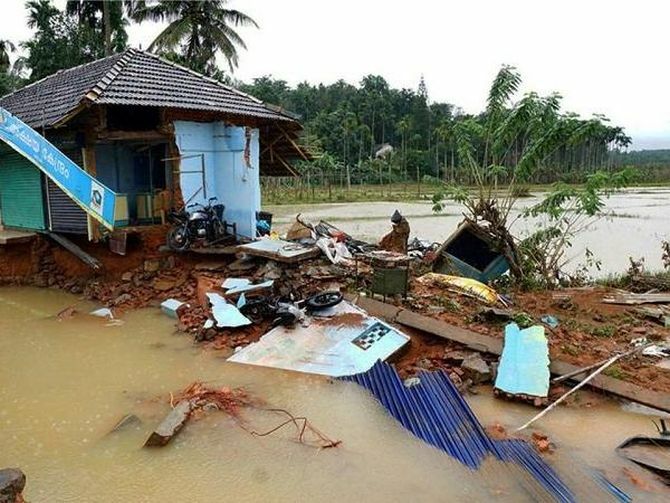 “The state is free to borrow within its limits, and the central government will release more funds to help rebuild the state after the floods,” the person said. As far as the central government is concerned, a well laid-down process is followed before deciding the aid to be given to a disaster-affected state, officials say. In case of drought, it is the Union agriculture ministry which takes the lead, and in case of other disasters, it is the Union home ministry. A team from the home ministry has already toured the state and another will be deployed as well to work with state officials and assess the monetary support needed from central funds. A panel led by Home Secretary Rajiv Gauba will meet soon and advise the political leadership on the amount needed to be given to Kerala. This will be in addition to the Rs 600 crore already allotted. However, this will only happen after a formal memorandum is submitted by Kerala. According to multiple sources in the state government, the World Bank officials already had several round of talks with the state finance ministry and also the office of Vijayan. The multilateral agency has assured speedy release of funds. The state is pushing for a loan of Rs 10,000-15,000 crore for 25 years, at an attractive interest rate of around 2.5-3 per cent. Finance Minister Thomas Isaac, while presenting the Budget for financial year 2018-19, had announced that the GSDP of Kerala for 2018-19 was estimated to be Rs 7.72 trillion. Based on this, the state’s current borrowing limit of 3 per cent may come to around Rs 23,100 crore. “We expect that the Centre will agree to this as the World Bank aid coming at such a low interest rate will be more like a grant,” the official said. The FRBM limit can be increased by the Centre if a state fulfills the following criteria - a state’s interest payments should not be more than 10 per cent of its revenue receipts, it should be revenue surplus and the debt to GSDP ratio should not exceed more than 25 per cent. Vijayan has also urged the Keralites across the world to contribute their one-month salary for the reconstruction of Kerala. He also urged the Malayali businessmen and industrialists across the world to contribute to the process of rebuilding Kerala. “The government is in the process of rebuilding Kerala and it will take into account everyone's opinion while preparing a draft for it. "Rebuilding Kerala envisages participation of everyone irrespective of their age or other differences,” Vijayan said, addressing the media on Wednesday. Rehabilitation process of the floods, that claimed close to 350 lives, has gathered momentum, a total of 1,97,518 people belonging to 53,703 families are staying in camps now, compared to 14,50,707 people belonging to 3,91,494 families on 21 August, said a state government statement.